I'm really having a '90s moment right now and honestly can't get enough. I'm loving the flashback and the comfort that these clothes bring. I was reading about his particular trend last week, which is being called Normcore (check out this article on Chictopia), and it makes perfect sense! Fashion always needs to move in new directions and what is more perfect than a fashion statement that doesn't make a statement? Ollie was actually the one that made the observation that it's pretty trendy to be wearing overalls, but being on the island (where these photos were taken) we could have walked into any dive restaurant and seen people wearing them -- not because it's the current trend, but because they are damn comfortable and they've been wearing them for the past twenty years. They wouldn't have even looked twice! I personally love this trend, and although I couldn't wear it everyday due to the lack of femininity, I love the way that it ties into the '90s with overalls, high-waist jeans, plaid tops, slide sandals and sneakers. The trick is to still make it current and not too sloppy. We had actually taken these photos before I had even realized what this particular trend was, but I feel like I've almost taken a little too naturally to it. I was long overdue for a pair of overalls and founds these ones from H&M, which I wore for a walk to get brunch with Ollie. It was still a bit cold out, so I threw on this plaid BF button-up that I picked out from my collaboration with Denim & Supply (and that I have been wearing with absolutely everything) and some slides and was ready to go! It really is a bit country, but oh so amazing at the same time. You have wonderful taste in clothes, indeed. This is such a simply, casual outfit, but so chic at the same time! Those photographs are adorable! Lovely look! I'm loving all these overalls on everyone! This pair looks great on you! Such a fun look! Loving those overalls! I've been trying to find a good denim pair for forever! But can't find any anywhere! Such a fun look! 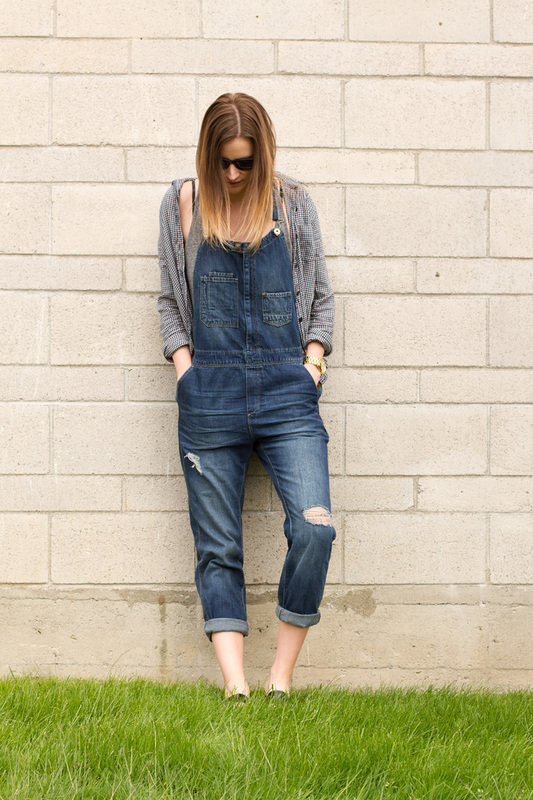 Loving those denim overalls! I've been searching for a good pair forever and have found any yet!